It is the job of a Paleontologist to date fossils that are found while digging. In this lab activity, students teach one another about fossil deposition and stratification. One group is tasked with determining the age of the plastic "fossils," and then deposits them in varying layers of sand and gravel. This fossil-rich site is then excavated by group two, whose job is to determine the ages of the fossils by recording which layers of geological strata they were found in. While employing the framework principles of Biological Evolution (LS4) and Earth's Systems (ESS2), students determine how fossils were deposited over the past three eras and learn to use one method employed in excavating fossil remains. This kit has been aligned with all published National Standards. Pre- and Post-laboratory assessments and vocabulary words all target specific Science and Engineering Practices and common core standards. The teacher guide also contains specific "Did You Know" concepts that link the real world with the scientific standards explored. A student copymaster is also included. This activity can be performed repeatedly with the materials provided as long as the sand layers are not mixed and can be separated. 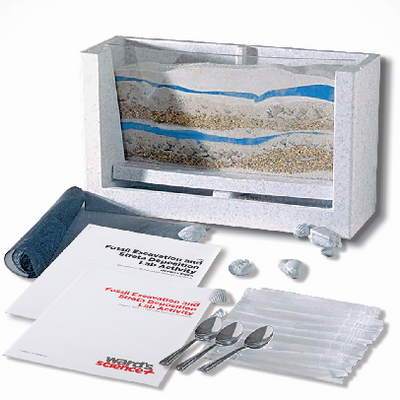 Ordering information: This activity contains 1 View box, 1 Package: gravel, 1 Fiberglass screen, 1 Package: course sand, 1 Package: fine sand, 1 Package: medium sand, 1 Package: blue sand, 1 Package: pebbles, 1 Metal spoon, 6 Zip-lip plastic bags, 1 Package: fossils, and Teacher's Guide and Student Guide. Materials needed but not provided include Metric rulers, Tape to mark starting point/ground level, Paper to hold various soil layers, books for further research, and a calculator. Both sections of this lab can be accomplished by one class over a two day period, or they can be alternated between several different classes, with the first class doing the deposition of the fossils in the strata, and the next class doing the excavation of those same fossils.